Social Engineering – manipulating individuals to provide confidential information, perform actions or allowing access to secured locations. Purposely “conning” individuals for the purpose of obtaining information or access to allow for nefarious cyber activities. The tendency of our culture in South Dakota is to be helpful and thus makes us very vulnerable to being socially engineered. Services like Dropbox and Google Drive are very convenient for our personal use of files and photos. Yet, they are not acceptable for storing state data for a number of reasons. They store data in unknown data centers around the globe managed under varying laws and by different groups. The State prefers knowing where the data will be stored and what laws govern the data center they will be stored in. In addition, their terms of usage often violate state legal requirements and good business practices. A better choice for this type of service is the state’s OneDrive service that runs under SharePoint. And best of all, it’s available at no added cost to you. For more information or a demonstration of this service, please reach out to your BIT Point of Contact. Infrastructure – The technology (hardware and software) that comprise the computer network, phone network, and connections to the Internet. In the pre-Internet era, con men, also known as confidence men, would gain victims’ confidence through the use of deception, to defraud them. The same principles are being used today, only now to an even greater efficiency through the use of online scams. One of the most prolific means for online scamming is phishing. When using email, it is difficult to know, with certainty, with whom you are communicating. Scammers will utilize this uncertainty to pose as legitimate businesses, organizations, or individuals, and gain the trust of users. If a scammer is able to gain the trust of victims, they can leverage this trust to convince victims to willingly give up information or click on malicious links or attachments. To gain users trust, scammers will appear like legitimate businesses or organizations, by spoofing the email address, creating a fake website with legitimate logos and even providing phone numbers to an illegitimate customer service center operated by the scammers. Phishing scams are perhaps one of the best-known forms of email scams. This type of scam involves a scammer pretending to have a fortune that he or she is incapable of accessing without the help of someone trustworthy, which happens to be you! The scammers will try to obtain the user’s financial information using an empty promise of sharing the wealth in exchange for their help. Spear-phishing is a targeted and personalized attack in which a specific organization or an individual is the target. These attacks will utilize information about the user email addresses, which are similar to those of their acquaintances to entice the users to either divulge sensitive information or download a malicious file. This often requires a lot of information gathering on the targets and has become one of the favored tricks used in cyber espionage. If you are mindful of potential phishing traps and observant of the telltale signs of a scam, you can better defend against a phishing attack. Be cautious about all communications you receive including those purported to be from “trusted entities” and be careful when clicking links contained within those messages. If in doubt, do not click. Don’t respond to any spam-type e-mails. Don’t send your personal information via email. Don’t input your information in a pop-up; if you are interested in an offer that you see advertised in a pop-up ad, contact the retailer directly through its homepage, retail outlet or other legitimate contact methods. The email has poor spelling or grammar. For secure transactions, look for a lock icon in the URL. The use of threats or incredible offers is a common tactic that tries to elicit an emotional response to cloud the user’s judgment. The URL does not match that of the legitimate site. Scammers cannot use the same URL associated with the legitimate websites, so they will tweak the address of their spoofed website so that at a quick glance it looks legitimate. Don’t trust a file based on its extension either. There are a variety of tricks to hide the nature of the file. Lastly, make sure you have an up-to-date anti-virus software program installed. Enable the feature to scan attachments with the anti-virus program before downloading and saving them to your computer. Much like us, mountains often seem to have personalities. At the very least, each mountain has its own distinctive feel, with there being a veritably infinite set of variations amongst the mountains out there. Sounds crazy, but it seems like many people who spend some time in the mountains, come away saying something similar. But, have you ever had that experience where you see somebody in photos, or hear about a person through third parties, but when you finally meet them in person, they seem quite different from what you expected and built up in your mind. More rarely, some folks turn out to be almost exactly what you expected. 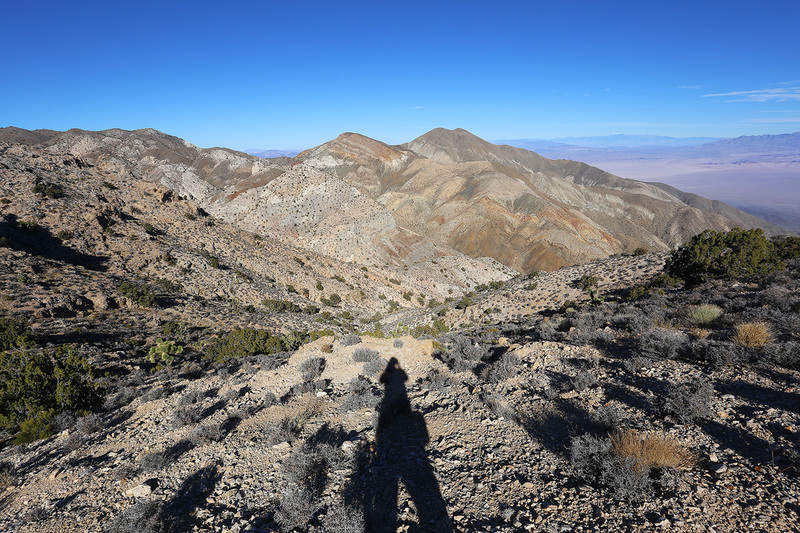 Over the Christmas break, I went on a road trip that involved hiking two different desert peaks – Avawatz Mountain outside Baker, California and McCullough Mountain just over the border in Nevada – that were fine examples of both scenarios. Avawatz turned out to be different than what I had expected for a few reasons, starting with the drive in to the “trailhead”. The guidebook talks about what sounds to be an easy-to-reach 2wd trailhead and a 4wd trailhead that is further in. 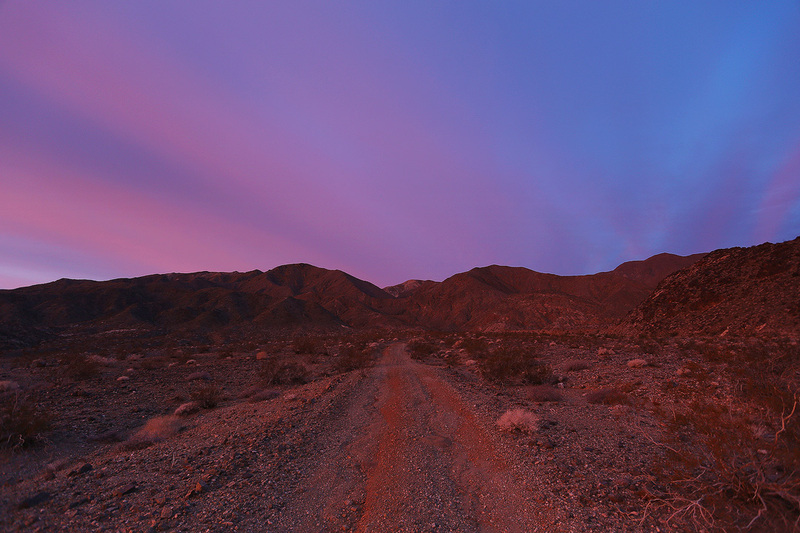 The 2wd trailhead is at the base of the mountains at what’s called Mormon Springs. The hike from there is around 13 miles rough trip and perhaps close to 4,000 feet of gain. 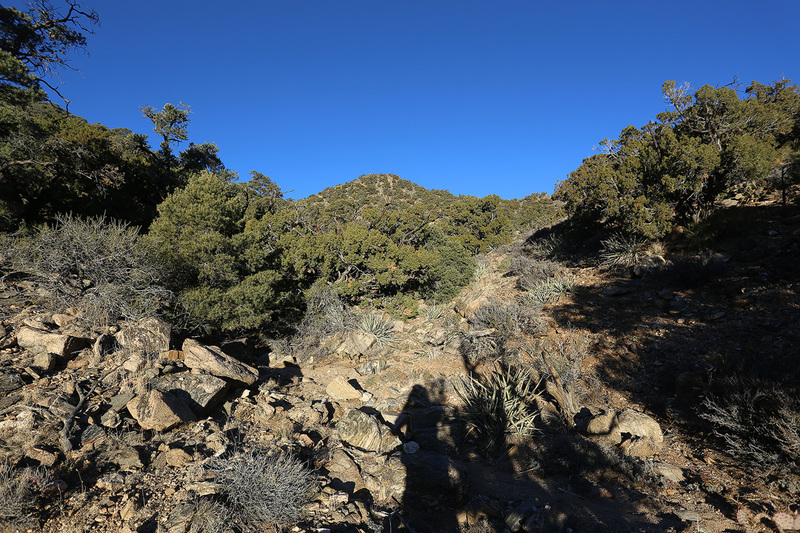 Depending on how far you can make it up the 4wd road section, the hike could be as short as six miles round trip, with considerably less gain. Well, apparently, things have changed since the guide book was written. In fact, based on other reports I have read, something must have changed in the past couple years. The 4wd road was gone. And, I mean gone, like obliterated, an apparent victim of flash flooding, which left only a rutted out wash instead, with no trace of the old road remaining. Even the 2wd road was rougher than anticipated and one section stymied me on two attempts in my 4wd 4runner. I could have probably eventually made it through, even with my balding tires, but I get nervous with stuff like that when I am solo, so I ended up parking about a mile shy of the 2wd parking, making for a 15 mile day and roughly 5000′ of gain. All this turned out to be advantageous when it came to the photography, though. 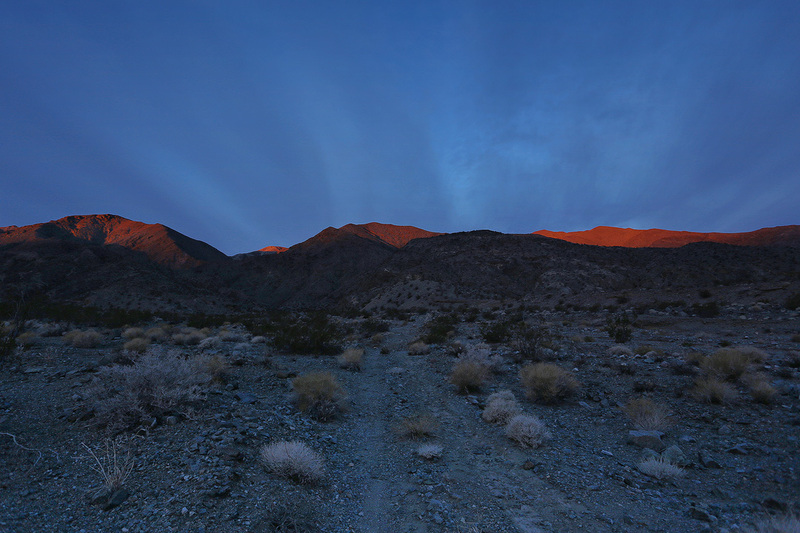 As I started out for the peak in the morning, a little ways down in the desert was THE place to be, as the sun came out for a beautiful sunrise light-show. The morning lighting was so moody and colorful and the hillsides of Avawatz Mountains were also briefly lit up with wonderful, pastel-like hues of color. After roughly a mile of soaking in this amazing light, I entered the canyon leading into the mountains. This timing was perfect because the sky and lighting got pretty bleak once the sunrise was over. Although the canyon portion wasn’t the mindless, easy stroll up a road I was expecting, it was still rather pleasant, albeit a bit more tiring. Some parts of the wash were a bit messy and rough, but many stretches were sandy and pleasant enough. I love the feelings of these desert canyons at times. 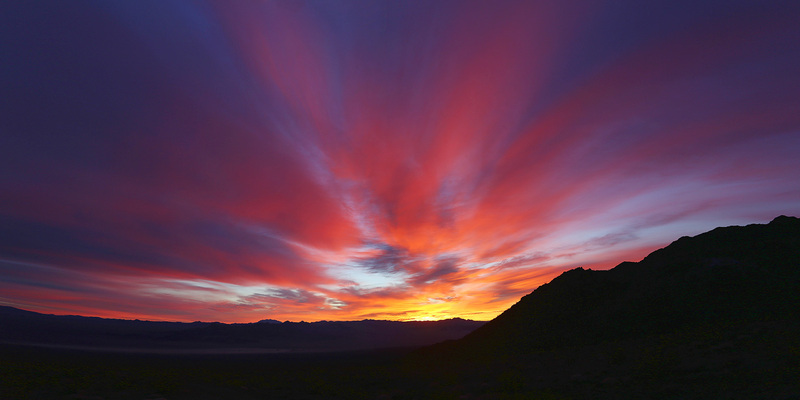 They seem like a magical place – focal points for the mysterious energy of the desert. Sometimes, I swear you can almost feel a timeless, serene energy reverberating off the canyon walls, especially so when they are glowing golden in a late afternoon light. What I guess was a raven, maybe a hawk, would occasionally fly by, squawking over me with that classic sound you often hear in a movie with a desert scene. It’s mysterious call would echo off the canyon walls. It reminded me of that scene in the The Doors movie when Morrison wanders off in the desert, minus the hallucinations since I wasn’t on Peyote myself. 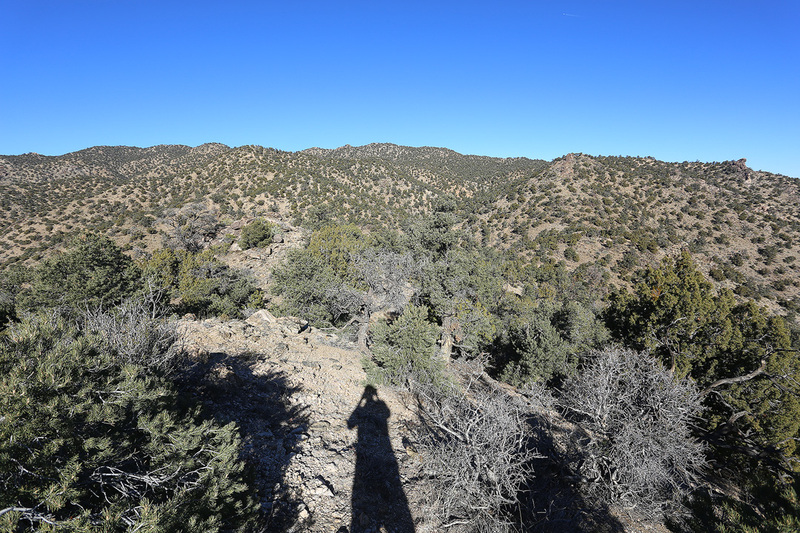 After a few miles in the canyon, I found myself at the small, abandoned radio tower of sorts along the ridge. Shortly before this spot, I was able to pick the old road back up where it climbs out of the canyon putting a safe distance between itself and the flash flooding below. From the tower, I followed the road as it contoured around to the hillsides on the far side. I picked a semi-random spot to leave the road and gain the ridgeline, but not before meeting the crux of the route. This consists of a steep hillside with white cliffs, which was now towering in front of me. It mostly looked like it would be a bit tiring, but I could see obvious ways around the cliffs, so I wasn’t too worried about them. In fact, it wasn’t too bad overall. I just took my time and next thing I knew I was on top and starting out along the ridgeline to Avawatz. This portion was pretty long too, but I had some amazing clouds to gaze at and occupy my mind as I strolled along. 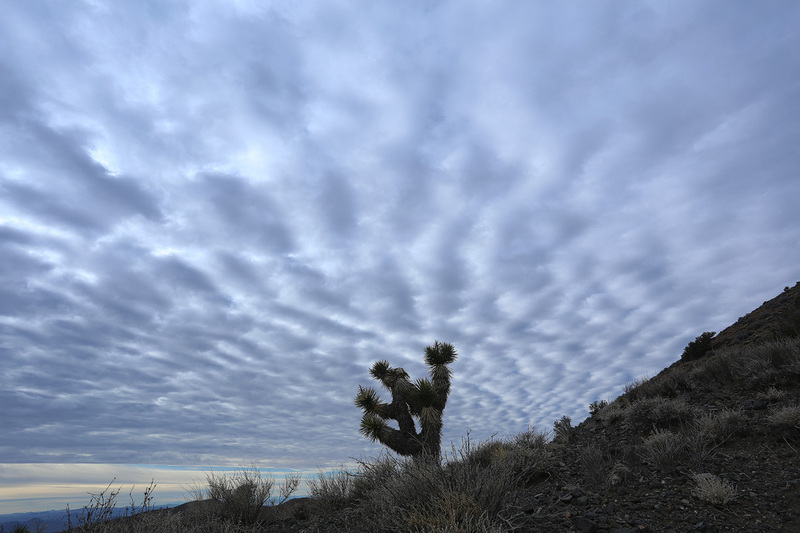 The clouds looked surreal: popcorn shaped puffs, forming checkerboard like patterns off to the horizon in both directions. I was lucky to have these clouds spice up an otherwise bleak, gray sky. In addition, the timing of my arrival at the summit was rather fortuitous, in that all the clouds and bleak lighting I had since after sunrise, mostly cleared up right after I got there, leaving me crisp, clear vistas with just the right amount of clouds to spice up the view. 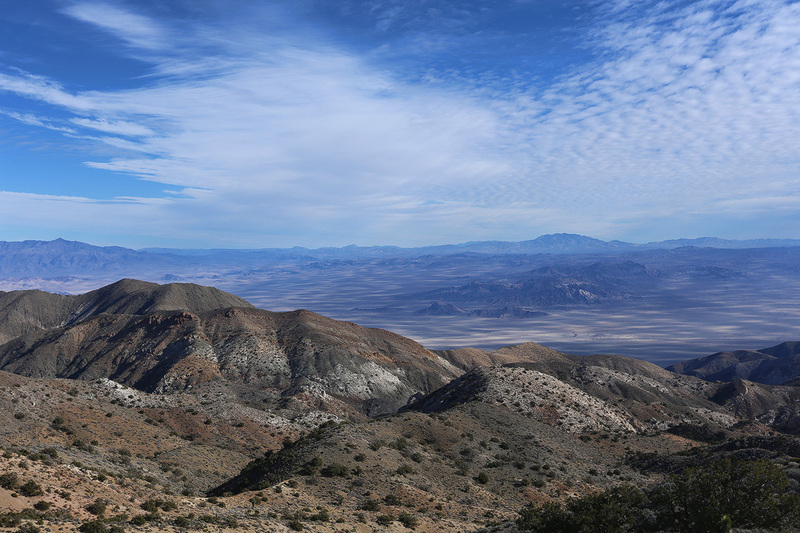 Some of the remaining popcorn-puff clouds left a checkerboard like pattern of shadows across the desert floor to the East. I rested for some time, took photos, snacked and soaked in the views as much as I could before starting down. Most of the hike back down was uneventful. I enjoyed snapping photos of the hillsides on the way down, which were now vibrant and colorful with the bright, clear afternoon light. 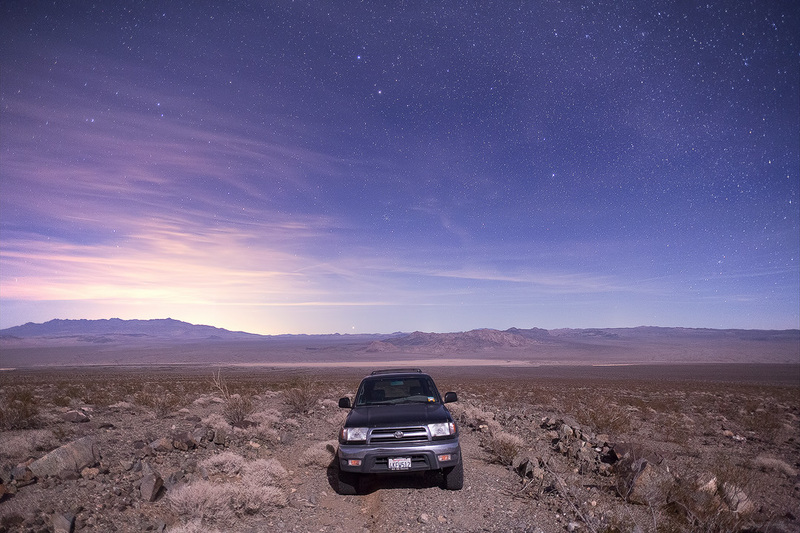 When I got back to the car, I enjoyed a beer and relaxed in the back of the 4runner cooking up some dinner – black bean soup with a can of chicken thrown in. A pretty tasty meal for a hungry hiker. After dinner I packed up all my stuff and slowly made my way down the rough road and on to McCullough Mountain. McCullough Mountain turned out to be almost exactly what I expected and built up on my mind. Right from the drive in, McCullough felt a bit familiar, despite never having the pleasure of meeting this mountain in person before. 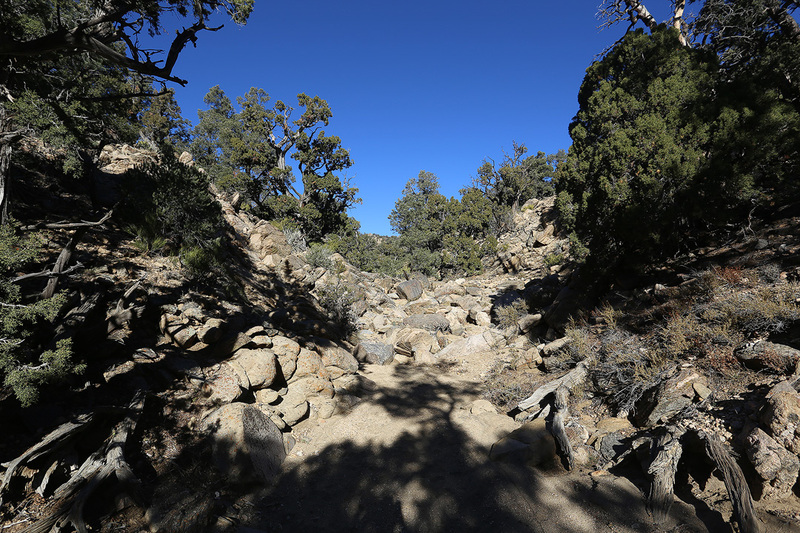 There was roughly eight miles of dirt road to get to the start of the hike near Pine Springs. This road was in considerably better condition than the road to Avawatz and the miles went by quickly. There were still some rough spots, but at least I could get above 10 mph quite often, unlike with Avawatz where I felt like my speedometer was on zero most of the time. I took a few night sky photos on the way in, but between it not being the season for Milky Way photos and the moon being out I had a hard time getting a nice photograph of our galaxy. 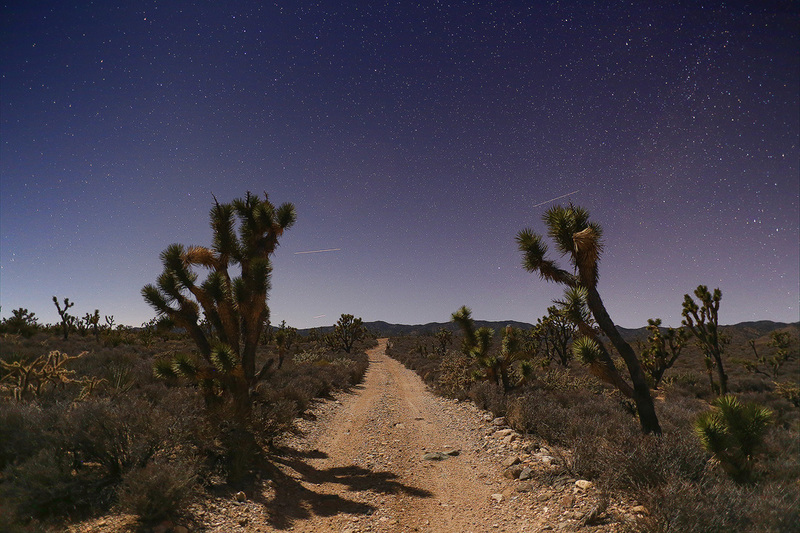 Still though, I did get one, or two, of the dirt road and Joshua trees with a nice star-covered sky. With it already being dark and my long hike earlier in the day, I retired to the back of the 4Runner for a good night’s sleep shortly after I arrived. It was awfully cold when I started the hike to McCullough the next morning. It was the kind of cold where I felt like I had to keep moving just to avoid going hypothermic. I tried to stop and take a few photos of the morning light as the sun began to rise, but my fingers were stinging and going numb almost instantly, accompanied by rather intense shivering. All this initially made photography a particularly unpleasant activity, resulting in only a couple photos of marginal quality. 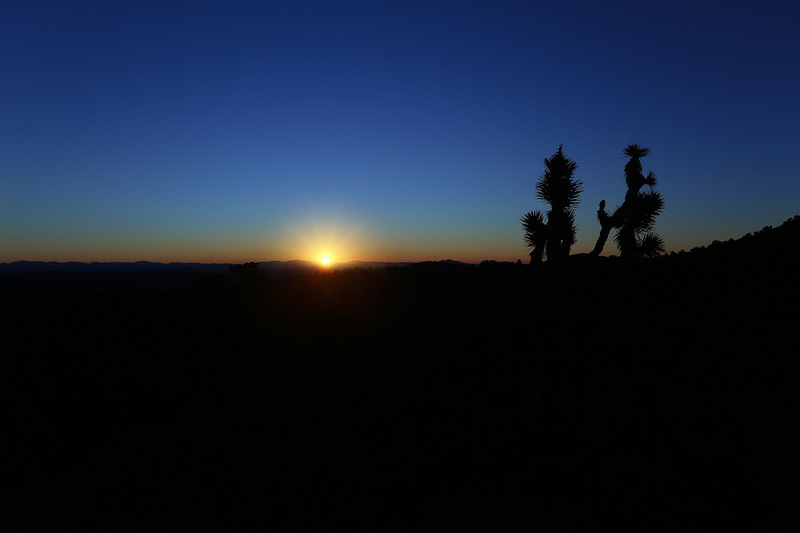 But, once that sun started to rise, it warmed up really, really fast and next thing I knew I was removing a few layers. McCullough has a reputation of being a navigation, or orienteering, challenge and right from the start I could tell it would live up to this reputation. It’s not even real obvious you are hiking into actual mountains in the beginning, let alone having a visible summit, or high point, you can aim for. Initially, McCullough is hidden behind an intervening ridgeline covered in many similar looking hill tops, or high points. Really, it looks like you’re just hiking into a jumble of bushy, desert hillsides, with all directions looking the same. There are many washes to choose from and no real clear high point of reference that makes one more appealing to take than the other, in so far as being sure it’s taking you in a direction towards the actual highpoint of the range. A topo map and compass would make all this easier, but even that would be challenging. Luckily, I cheated and downloaded a pre-planned route I came up with into my GPS and mindlessly followed that to the top. Although, having my GPS fail on me more than once before when I needed it, I was at least smart enough to vigilantly make note of my surroundings in case I had to hike back without any electronic assistance. 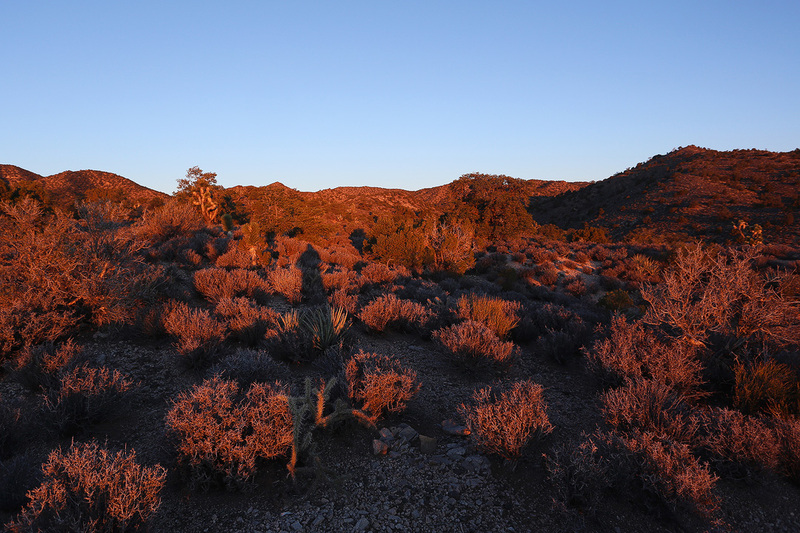 Overall, the hike was very pleasant, much of which involved hiking up sandy tree-lined washes while being bathed in the warm, golden early-morning sunlight and listening to birds chirp some morning song. Apparently, the mountain is extremely popular with cows, as there were cattle tracks all over often forming a clear herd path. At first, I thought of the old saying, “follow the cows home”, in the event that my GPS actually did die, but it soon became clear cows had been up and down every canyon I came across, leaving there tracks unhelpful in choosing which way to go. Maybe all the tracks were a result of them getting lost in this maze of pine, creosote and sage. It didn’t take long to get to the summit and I think I was on top before 9AM, enjoying the views off into every direction. I could see Las Vegas peeking out behind some intervening hillsides. It sure looked tiny from my comparatively lofty vantage point. I could also see the massive solar power plant near state-line. Not too long into my stay I heard some cows that were making quite a racket down in the canyon I had just hiked up. On my way down, I noticed that it looked like a family consisting of an adult female, two calves and an ever-watchful bull that let me know I better steer (no pun-intended) clear as he let out some loud bellows that echoed across the canyon. When I finally made eye-contact with him, he reminded me of a neighbor’s dog back home who would always give the obligatory warning barks, but you could tell by the look in his eye and the energy he gave off that he was relaxed with no real desire to come after you. He just had to do what a guard dog is supposed to do, that is, bark at strangers. Likewise with this Bull. But I kept to the far side of the canyon to be safe, which suddenly didn’t seem as wide as it did before. Maybe I made more of a big deal out of this than I needed to, but tank-sized animals with large horns making loud bellowing noises always make me a little nervous. 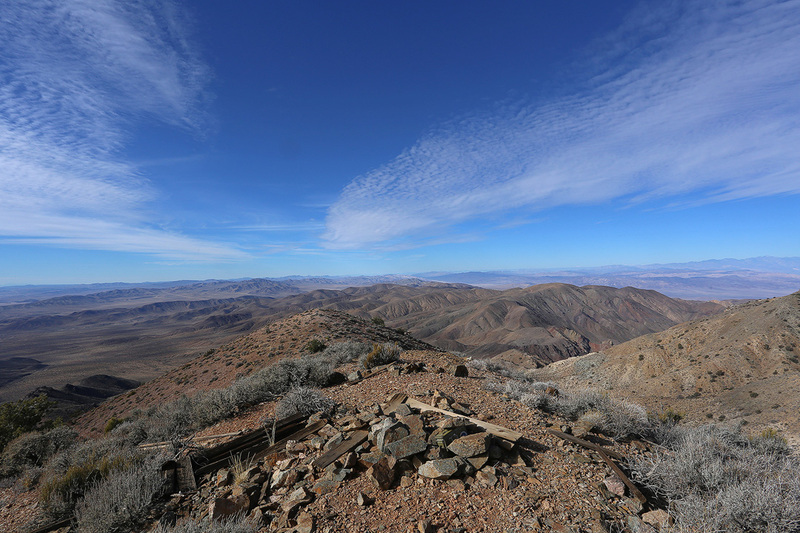 I had a nice lunch along the crest of the intervening ridgeline that was about halfway between my car and the summit. However, I wasn’t sitting quite where I thought I was sitting. Turns out that section of ridgeline looked just like a saddle I still needed to cross over to get into the correct wash that heads back to my car. So, even with the GPS in hand, I still managed to not traverse over to the saddle like I should have, instead dropping down too early and heading down the entirely wrong canyon! Luckily I caught my mistake after not too long, but it still left me with an extra couple hundred feet of hillside I had to now climb back up, so I could cross back over into the correct canyon. Consulting a topo map later on, I noticed the canyon I took by accident would have taken me pretty far from my car if I had not caught my error. 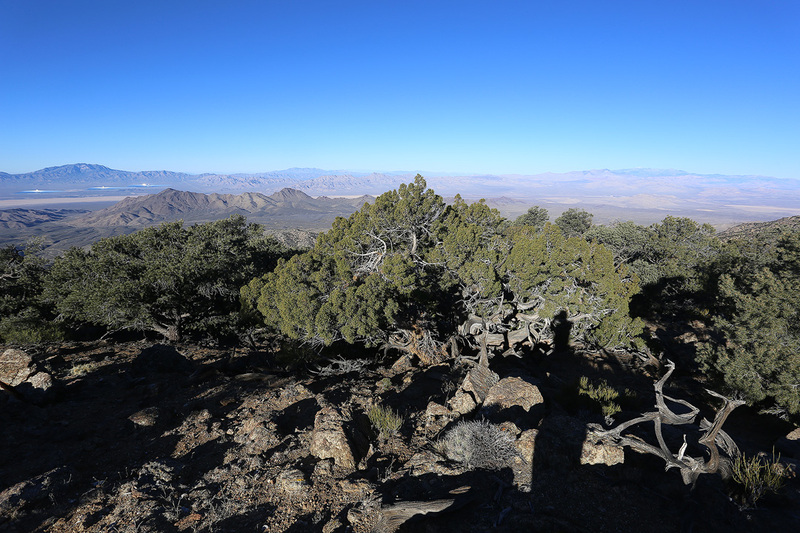 I would have found myself standing at the foothills of the McCullough Mountain range with over a mile of intervening ridgelines and washes between me and my car and wondering where the hell I was. But, luckily that didn’t happen and I arrived back at my car for a celebratory beer to toast off a couple of nice, adventurous days in the desert. Presented here are three different types of curb bits: A Myler Kimberwick, an Argentine snaffle, and a long shank Sweetwater. Each has been adjusted on the horse exactly how I would do so if I were going ride. I am pulling on the reins from the angle that would occur in the saddle, so that everything mimics the riding condition as much as possible. The point of this video is to show the relative degree of poll pressure (or lack thereof) that occurs with each of these bits. Poll pressure is often touted as an inherent component of the action of a curb (leverage) bit, but this is not necessarily the case, depending on the exact mechanics and design of the bit, the adjustment of the curb chain and headstall, the degree and angle of contact on the reins, and the horse’s head position. While it is difficult to capture on camera exactly what is going on, I have tried my best, and am providing this description to accompany the visual. First, please note that in order for poll pressure to be an action of the bit, the cheeks of the headstall must tighten, as they are the connecting pieces between the bit and the crown (poll). If the cheek pieces are slack, or if they do not further tighten from their default setting when rein pressure is applied, then poll pressure cannot be part of the action of the bit. For the Kimberwick, note that the cheek pieces grow very slack as increasing rein pressure is applied. What is happening is that, while the bit is indeed rotating and applying curb pressure, it is also rising in the mouth. The shanks are short and the curb activates slowly enough to allow the cheek pieces to loosen (you can see them bowing out). Poll pressure actually *decreases* from default when this bit is activated. Next, look at the Argentine. It is difficult to observe what is happening with the action here, and there is certainly no visible bowing of the cheeks, as with the Kimberwick. However, if you look closely, you can see that the cheek pieces remain completely in place and do not appear to have any additional tension placed upon them. The purchase ring of the bit slides freely over the cheek piece’s attachment–it does not grab and pull it forward, so the crown is not activated. I did place my hand under the crown piece of the bridle while pulling firmly on both reins, and I was unable to feel any tightening, even with considerable force applied to the bit (and a thankfully tolerant horse). Finally, consider the Sweetwater. This is a hefty, severe curb bit, so I did not pull as hard on the reins. Still, while it is hard to visualize in the video, you might note that there is indeed some tightening of the headstall’s cheek pieces. I placed my hand under the crown and was able to feel poll pressure that increased as I applied more force to the reins. In summary, poll pressure is certainly a component of the action of some curb bits in some scenarios, but it is not a foregone conclusion and its severity depends on multiple factors. Security Scanning Requirements: But Why!? Protecting web applications is an around-the-clock job. These days nearly everything that is connected to the Internet can be considered a target. Targeted attacks are designed to gather intelligence, steal citizen’s information, disrupt operations or even destroy critical infrastructure. As the threat landscape continues to worsen, government divisions are doing all they can to keep their web properties available and secure—this is where the security scanning requirements come into play. While various network security technologies are good at protecting the network layer, a web application can be considered a point of entry for a potential attacker. Web applications are programs ran through an Internet browser to allow people to fill out forms or to perform specific actions such as applying for hunting licenses. An insecure application can be used to compromise more than the information managed by that system alone. The insecure application can also be used to pivot the attack onto other systems and compromise information completely disconnected from that application’s scope. Hackers now target the web application layer by injecting attacks through the forms and fields that are open to citizens. The South Dakota Bureau of Information and Telecommunication (BIT) requires the scans to not only protect the application in question but to protect the state infrastructure as a whole. (State infrastructure refers to the technology (hardware and software) that comprise the computer network, phone network, and connections to the Internet.) That is why BIT performs security scans for every web application or website deploying in a production environment (available for the public to use). These scans consist of attempts to gain control of the system or to gain access to the State’s data using a variety of tools and manual methods designed with one objective: attempt to exploit security vulnerabilities in an application in a safe test environment before it is deployed to the public. As a general guideline, BIT normally (but does not always limit itself to) tests for the Open Web Application Security Project (OWASP) Top 10 vulnerabilities published at: https://www.owasp.org/index.php/Top_10_2013-Top_10. This is not an all-inclusive list— cyber security is a never-ending battle. The bad guys advance, security professionals counter, bad guys cross over—and so the cat and mouse game continues. There are always new threats and attack vectors and BIT adjusts in real time to confront these new threats. The need to properly secure web applications is absolute. Knowing what vulnerabilities exist within a web application helps government divisions contain possible points of exposure and safe guard citizen’s data. A special thanks goes out to Miguel Penaranda for providing us with this article! Please give Dan Roggenbuck a warm welcome as he joins Development Team 1 A as a Software Engineer! As a Software Engineer, Dan’s duties include developing software applications using C#.NET, VB.NET and ASP.NET. 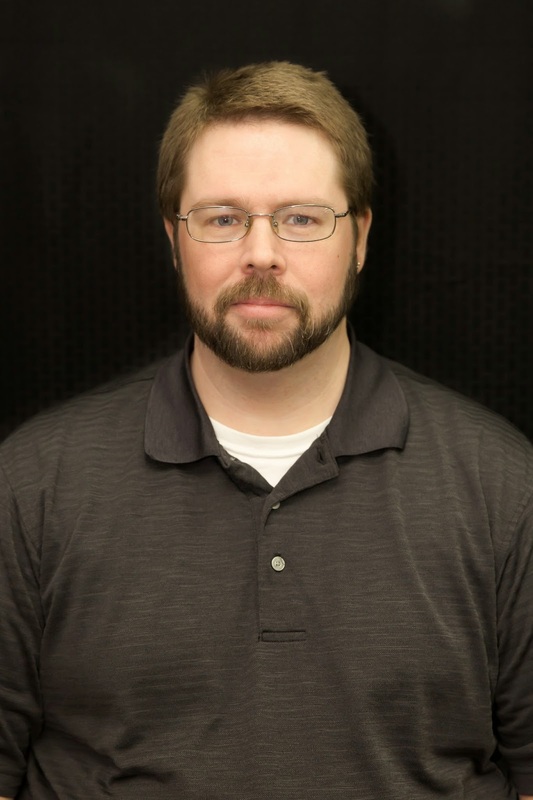 Before joining the Bureau of Information and Telecommunications team, he spent the last two years as a Java Developer at Eagle Creek Software Services. On a more personal level, Dan and his wife, Robin, have been married for over 14 years. Together they have three children (15, 10, 5) which keep them very busy! In his spare time he enjoys reading, fishing and playing games with his children. Welcome to the BIT team, Dan. We look forward to spending time working beside you and learning more about you in the future! The accounts on your computer can contain large amounts of personal information. It is important to take the necessary steps to protect the information about you, and in some cases, others. STOP. THINK. CONNECT., the global cybersecurity awareness campaign, gives us the below tips to keep our personally identifiable information protected while helping all digital citizens stay safer and more secure online. Make passwords long and strong: You have heard it all before, now put it to use! Combine capital and lowercase letters with numbers and symbols to create a more secure password. Write it down and keep it safe: Everyone can forget a password. Keep a list that is stored in a safe, secure place away from the computer.